I can be your office snack guy.. I can be your office lunch guy..
Cut the turkey into small pieces; refrigerate stuffing and turkey separately in shallow containers within 2 hours of cooking. 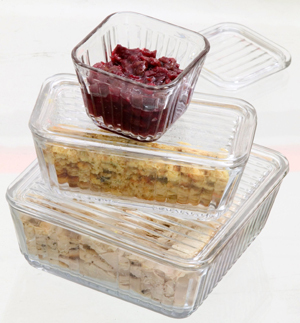 Use leftover turkey and stuffing within 3-4 days; gravy within 1-2 days; or freeze these foods. 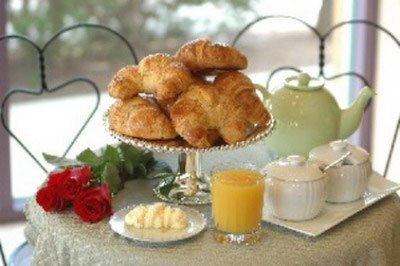 Reheat thoroughly to a temperature of 165 ° F or until hot and steaming. 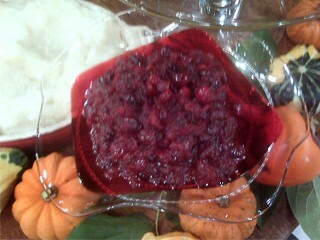 This refreshing cranberry sauce can be made on Thanksgiving Day. That is how easy it is! 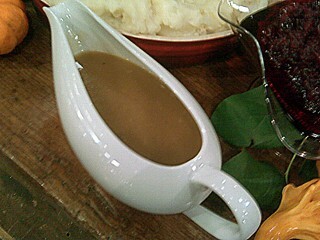 I recommend making 1/2 cup gravy per person since it is Thanksgiving. You need that much gravy to pour over everything, and for leftovers. So here is the formula, click below to read the recipe. A Thanksgiving turkey would be naked without the proper broth and gravy. 1. To cook rice, refer to package microwave directions. If package microwave directions are unavailable, a general guideline for four servings is 2 cups water to 1 cup rice. 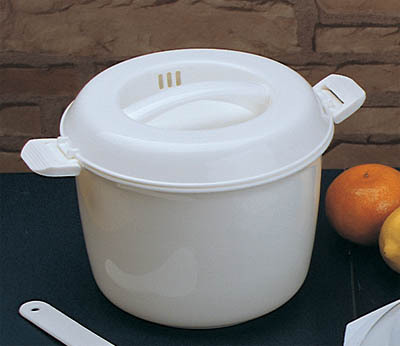 Fill cooker with water and rice. 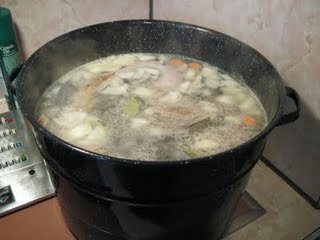 Cook on HIGH (100% power) 5 minutes; reduce to MEDIUM (50% power)15 minutes or until water is absorbed. 2. Place clear inner lid into base with outer rim upright. Set lid on top of cooker aligning lid tabs with handles. Pull locks up and over tabs to click in place. 3. Place cooker in microwave and follow package directions to begin cooking. Microwave ovens vary; adjust times and power levels as needed, beginning with shorter cooking times. 4. Remove from microwave with heat-resistant oven mitt or pad. Release locks from tabs. Caution: Steam will build during cooking. Using a heat-resistant oven mitt or pad, lift lid toward you, allowing remaining steam to escape away from you. Insert a utensil in center hole, lift clear inner lid toward you. 5. Refer to microwave manufacturers instruction manual for more information on cooking other foods. Whether your family calls it stuffing or dressing, most likely the first thing that comes to mind is Thanksgiving. However, stuffing is not just for holidays and not just for poultry. Many varieties of seafood and vegetables are also prime candidates for stuffing. Think it’s too early to start planning Thanksgiving dinner? Think again! Nov. 26 may seem like a long way off, but for the holiday host, it’s right around the corner. That’s why each Tuesday until Turkey Day, I’ll bring you preparation tips to ensure your Thanksgiving is as smooth as your gravy (should be). Here are two tips to start thinking about today! 1. Get a head count. Now’s the time to start inviting people to Thanksgiving dinner. If you’re thinking about it, chances are good your friends and family are, too. So if your cousin is bringing her new boyfriend, and both sets of grandparents are coming to town, as well as your parents and siblings, you’re going to need to figure out how to seat everyone at your small table with three mismatched chairs. Getting a head count this early ensures you’ll have enough time to borrow tables, chairs and whatever other furniture items you need to so that everyone can eat comfortably, and then have a place to lounge when the tryptophan-wine combo sets in. And don’t forget to find out who’s a vegetarian, who’s allergic to nuts, and any other dietary restrictions you’ll be dealing with. The last thing you want to hear as you put your pecan pie on the table is that your cousin’s new boyfriend has a severe nut allergy. Luckily, many grocery stores begin taking orders for turkeys around the beginning of November. And that early head count will let you know how much turkey you’ll need to ensure everyone leaves with bellies so full they’ll wish they’d worn sweatpants. Allow for one pound of turkey per person (that way you’ll most likely have leftovers for things like turkey sandwiches and other fun recipes I will be posting here after Thanksgiving. Here is a great tip for your Autumn baking, I discovered that most nuts such as PECANS, ALMONDS, and WALNUTS toast beautifully in the microwave. Many Fall recipes call for nuts which are in season right now. By toasting them first, the flavor explodes and enhances your recipe. Instead of using your stovetop or oven, put this microwave method to the test. It worked like a charm. Evenly spread nuts in a flat microwavable dish such as a small stoneware bar pan. Microwave on high or full power for 3 to 4 minutes for 1/2 cup of nuts and 4 to 5 minutes for 1 cup. Stir every 45-60 second intervals (which is good for all nuts) to control the toasting times during cooking. Do not over cook as nuts will continue to darken after being removed from the microwave. Do you have leftover SNICKER BARS Halloween Candy? Heat oven to 350°F.Spray cookie sheetswith nonstick cooking spray. In large bowl, combine brown sugar, sugar and butter; beat until light and fluffy. Add milk, vanilla and eggs; blend well. Add flour and baking soda; mix well. Stir in oats until well combined. Stir candy pieces into dough.Drop dough by heaping tablespoonfuls 2 inches apart onto sprayed cookie sheets.Bake at 350°F. 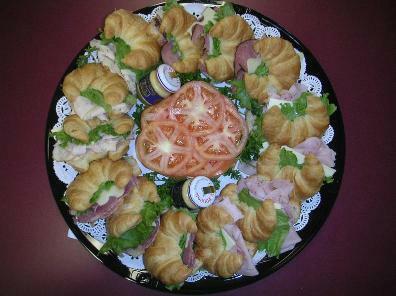 for 10 to 12 minutes or until light golden brown. Cool 2 minutes; remove from cookie sheets.